Award-winning Yorkshire Wildlife Park is on target for another record year for the 6th year running with visitor figures an incredible 29% higher than the last year after a busy Summer. The innovative park’s combination of dedicated conservation and fun for all the family has drawn in the crowds making it the nation’s fastest growing wildlife attraction. 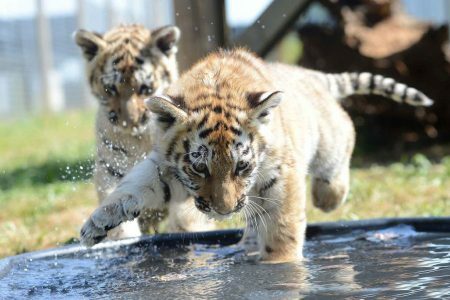 A 29% surge in numbers has come after the birth of rare tiger and leopard cubs at the park, near Doncaster, which are crucial to the conservation programmes of both species of these at risk big cats. The Safari Nights of fun and live acts every Saturday evening during the school holidays have been another highlight of the season. “We have already welcomed over 560,261 guests already this season compared to 434,000 in 2014, which is an increase of 29 per cent. We are on track to reach over 682,000 visitors by the end of the financial year which is a remarkable achievement for a business which is only 6 years old. It is the support of these visitors that has enabled the investment for the Park to grow over recent years,” said John Minion, CEO of Yorkshire Wildlife Park. The park opened in 2009 and had 66,000 visitors in its first year. It broke through the landmark 500,000 annual visitors for the first time last year and had 556,000 visitors in the 2014 season. The arrival of a trio of Amur Tiger cubs in March was a major boost – the video of their birth at YWP drew a global audience of more than five million. More breeding success was to follow recently with three Amur Leopard cubs who were born in June. Both species are critically endangered and the cubs will play a vital role in the European breeding programmes. Polar bears Victor, a 16-year-old, and two-year-old Pixel, who arrived at Easter, are also huge favourites with visitors who appreciate seeing these powerful and striking animals swimming, playing, climbing and roaming in the extensive reserves at Project Polar. The habitat here is based on the summer Arctic environment and the lake in the main reserve is an acre in size and 8m deep. Project Polar is believed to be the largest reserve for Polar Bears outside Canada. This year, the staff team at YWP has been delighted to win the Sheffield City Region Award for Business of the Year an also shortlisted as a finalist as Large Attraction of the Year in the Welcome to Yorkshire White Rose Awards. The park has won an international reputation by offering unrivalled access to some of the worlds most beautiful and at risk animals, including the Amur Leopards and Tigers, Lions, Giraffes and many more. In the process, it has created hundreds of jobs and delivered over £7m investment to the local area.